This is a sponsored post written by me on behalf of Marzetti® Brand. All opinions are 100% mine. These Garlic Parmesan Steamed Carrots are a foolproof quick and easy side dish for Easter or any night of the week. Marzetti® Veggie Drizzle™ Finishing Sauce makes this dish come together in a flash! It’s almost Easter and time to start thinking about the big meal! There’s usually a lot to do. Cook a ham, bake an adorable bunny cake, make 15 different delicious side dishes. And if you’re lucky? Some creative cocktails! Virgin ones for me this year. Not to mention filling baskets and hiding eggs. Sooooo, maybe just maybe you are looking for a shortcut or two? I recently discovered Marzetti® Veggie Drizzle™ Finishing Sauces for cooked veggies. They’re the perfect, easy way to add tons of flavor to cooked veggies. The sauces can be found in the produce section of the grocery store, near the pre-cut vegetables. And they’re great for turning plain cooked veggies– microwaved, steamed, roasted, boiled!– into flavorful side dishes. The Garlic Parmesan flavor immediately piqued my interest since those are two of my favorite flavors. It’s creamy and rich, and a lot like a parmesan peppercorn dressing. Super delicious! I think it would be awesome on potatoes. It also sounded perfect for some cooked carrots. And since carrots are a classic spring veggie, I thought these Garlic Parmesan Steamed Carrots would make a perfect Easter side dish. It takes less than 10 minutes to make this dish, so it’s so perfect for squeezing into your busy morning in the kitchen. These finishing sauces aren’t just good for big holidays, they’re great for any busy weeknight too. You can steam veggies in the microwave (or cook them any way you like– throw them on the grill if you’re cooking up some meat, too) and top them with a few dollops of Marzetti® Veggie Drizzle™ Finishing Sauces for a delicious and nutritious veggie side dish in literally just a few minutes. Besides the Garlic Parmesan flavor, Marzetti® Veggie Drizzle™ Finishing Sauces comes in Thai Chili, Lemon Basil and Honey Balsamic. The Thai Chili is sweet and spicy, perfect for broccoli, green beans or snow peas. The refreshing, citrusy Lemon Basil pairs well with cauliflower and zucchini, and the sweet and savory Honey Balsamic would be amazing on some brussels sprouts, butternut squash or sweet potatoes! 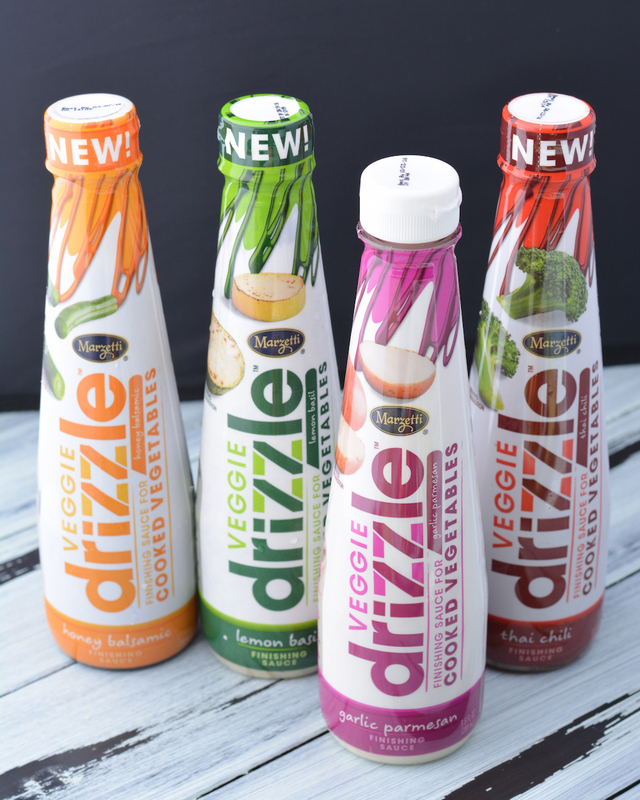 All Marzetti® Veggie Drizzle™ Finishing Sauces products range between 20-45 calories and are packed with so much flavor. They’re a great shortcut find! 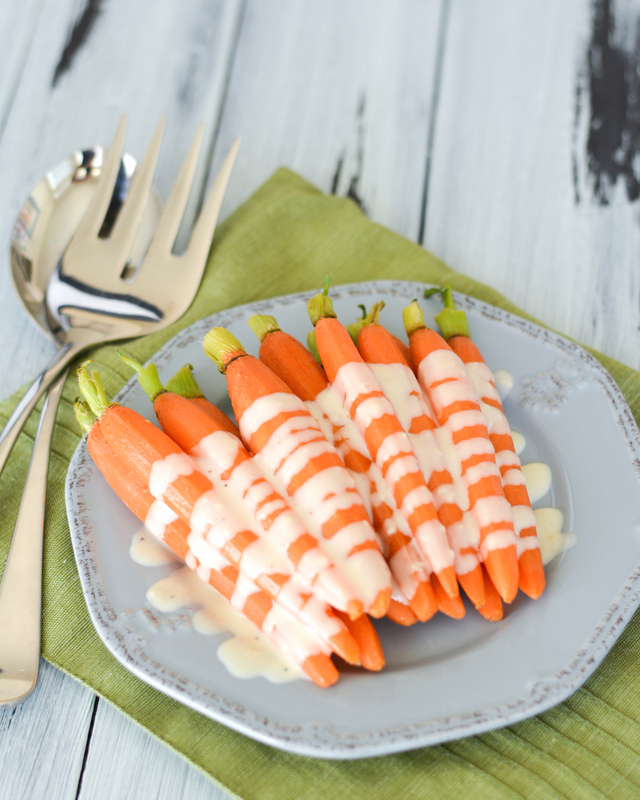 Steam carrots in the microwave: Place carrots in a microwave-safe dish with about 1 tablespoon of water per pound of carrots. Cover and cook on high 4-6 minutes, until tender. Remove from microwave and uncover. 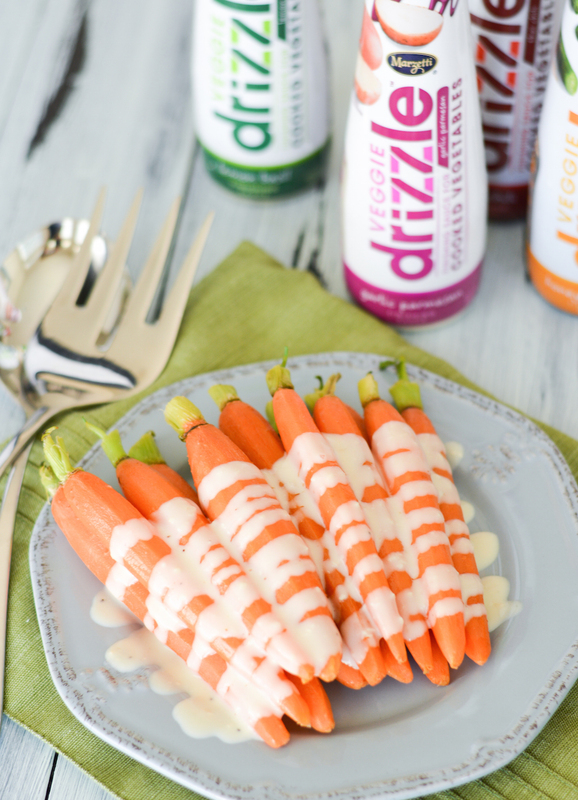 Let cool slightly, then transfer to a serving dish and pour zig-zags of Marzetti® Garlic Parmesan Veggie Drizzle™ Finishing Sauce over the carrots. Serve immediately. Do you like taking shortcuts for quick weeknight meals? What’s your favorite easy way to cook veggies? I’ve never seen these veggie drizzles in the grocery, but I sure am going to keep a look out for them. 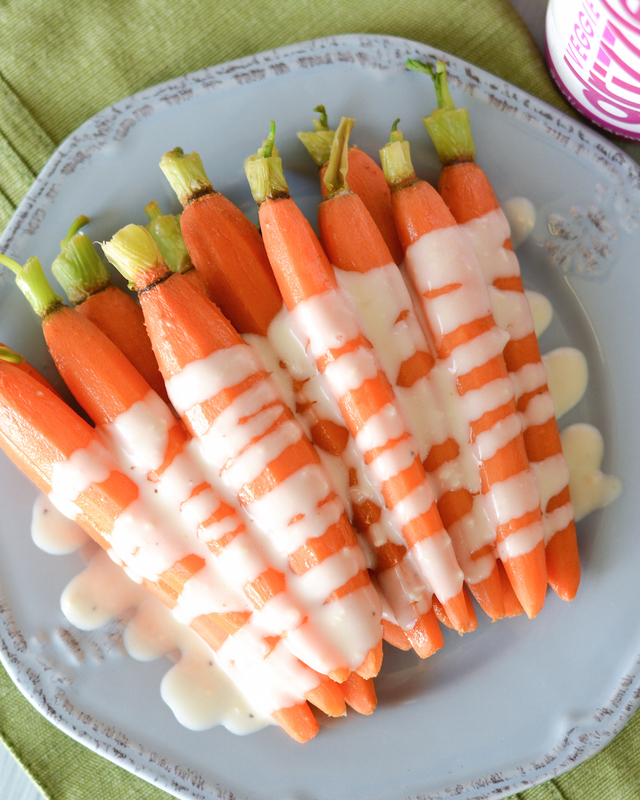 Those carrots want to be in my belly! 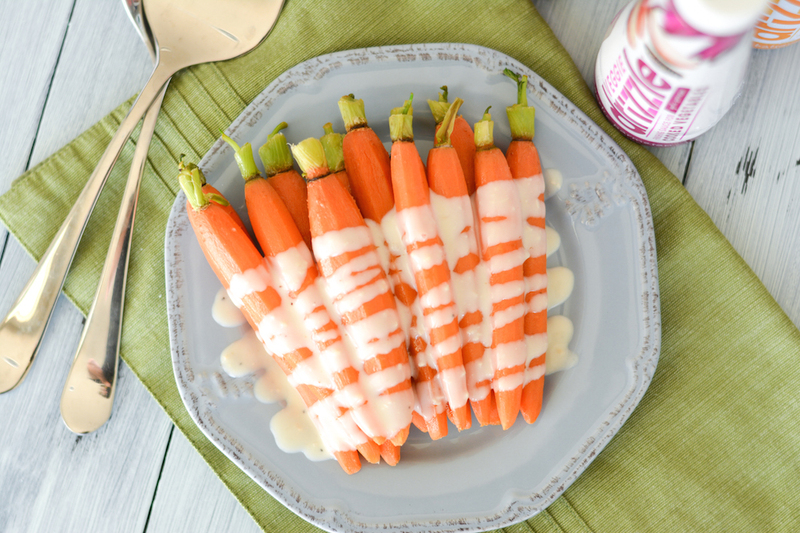 These carrots look divine!! Such a simple side dish! That garlic parmesan sounds pretty good! I’m with you in having simple dinner sides! Which grocery store did you find the sauce in?